The full package includes the following listed below. Aquila Private Game Reserve has announced the opening of its newly completed exquisite African Spa offering treatments using natural products that harness the medicinal powers of indigenous plants, flowers and herbs and are free from petrochemicals, synthetic ingredients, colorants and preservatives. Featuring 2 x large heated indoor pools, Steam room, Sauna, nail bar, 10 Treatment rooms, a domed couples or group therapy room and an outdoor pool - Click Here - To view the Aquila Game Reserve Spa info. HELICOPTER Fly-IN - combing the Morning Safari. Pick-ups & drop-offs from all city centre accommodation establishments, contact reservations for other pick up points. Duration of transfer: approximately 2 ½ hours depending on pick up and drop off points. This package includes on arrival at Game Reserve by request - The min age for this option is 16 years. Stays of 2 nights will receive a complimentary horseback safari swap and a 3 night stay will receive a complimentary horse back and quad bike safari swap, subject to availability. Please note that the max weight for the horse back safari option is 95kg. You don’t need to be an experience horse rider as the horse ride is quite gentle. Includes entrance fees / Excludes lunch and fees to optional visits. Includes entrance fees./ Excludes lunch and fee to optional visits. Includes cellar tour, 3 wine tastings and one cheese tasting / Excludes lunch and optional visits. Approximately an hour and a half away from Cape Town is the seaside town of Hermanus. Hermanus is hailed as offering the best land based whale watching in the world. From May onwards Southern Right Whales pay homage to these warm, shallow waters in order to calf their young and to mate. The best time for whale watching is between August and November and at this time the bay is dotted with whales. More often than not, they're more than happy to put on a performance. Visitors keen to spot a whale or two need only walk along the cliff path that stretches for 12km from one end of the town to the other. Whales can be seen as close as 20 metres away frolicking in the sheltered bay or just beyond the breakers.Includes entrance to Harold Porter Botanical garden / Excludes lunch. Includes entrance to Harold Porter Botanical garden / Excludes lunch. Includes visit to the District Six museum, Langa & Khayelitsha (largest township), community school / crèche, Shebeen (informal pub), charismatic church service (Sundays only). Evening tour includes welcome drink and dinner. Includes: Entrance fees. / Excludes: Cable car fare. In keeping with the design and flow of the architecture at Aquila, the Standard Cottages do not compromise the experience nor standard. Each has its own patio, corner bath and outdoor rock shower. Cottages are equipped with mini bars, fans and feature ‘coal’ stoves for that extra bit of warmth and cosiness in the colder months. Newly completed accommodation lodge complex - Lodge Rooms have twin beds which can be made up to Queen size beds and have a shower en suite. Please note that these rooms do not have any views and are ideal for those with a limited budget. Itineraries as above - inclusive comp bottle of house wine & 1 game drive may be replaced by a horseback safari, subject to availability. On day 1 you will be collected from your accommodation in Cape Town for the two hour journey to Gansbaai. Formalities, safety briefing, breakfast and coffee is served upon our arrival at the Great White Adventure Centre. We proceed to Kleinbaai harbour and board our boat (Megalodon ll) ready to depart. Depending on shark activity and weather conditions, the duration of the tour out at sea is approx. 4 hours. Snacks and drinks are served on-board the boat and a light lunch is served upon our return to shore. You are returned to your Guest House to freshen up before dinner. On day 2 you will be collected from your Guest House and transferred to the harbour where the boat will await you. After the tour you will be returned to your own accommodation in Cape Town. Please make sure your luggage is ready and packed at your accommodation, before leaving on your shark tour on day two. (Exact times will be confirmed the day prior to the tour). Follow the Atlantic seaboard (Golden Mile) along the majestic Twelve Apostles, to the white sands of Clifton and rugged beauty of Llandudno and nudist beach, Sandy Bay. 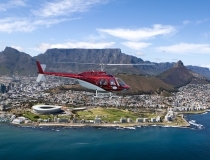 See the "Republic" of Hout Bay nestled below the mountains, view the stately Groot Constantia, before flying around Table Mountain and the City Bowl, then returning to the heli-pad at the V&A Waterfront for your glass of complimentary sparkling wine. 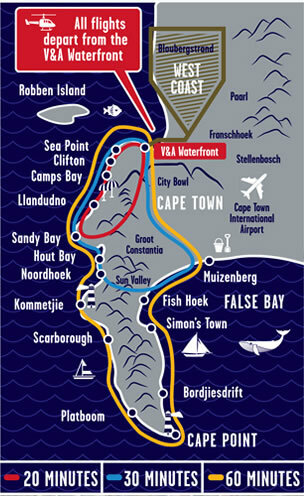 Follow the Atlantic route, view the majesty of the Twelve Apostles, the white sands of Clifton, the wreck off Llandudno and the "Republic" of Hout Bay with the magnificent seal island. Follow the heart stopping curves of the Chapmans Peak highway, built by Italian prisoners during World War II. Fly over long lagoon laced stretches of Noordhoek Beach. Take the inland route through Sun Valley to Fish Hoek, along Muizenberg, past the lush Constantia Valley and Groot Constantia, over Table Mountain and the City Bowl and back to the V&A Waterfront for you glass of complimentary sparkling wine. Follow the seaward route out to Robben Island Robben Island (Dutch for Seal Island), with a 360 degree trip around Island. On the flight you can experience an important piece of our South African History. Our beloved Nobel Laureate and former President of South Africa, Nelson Mandela, was imprisoned there for 18 years. 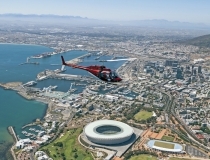 This is a Cape Town helicopter experience that will allow you to see our beautiful city from the air as well as experience an important part of our past. Then follow the Atlantic seaboard (Golden Mile) along the majestic Twelve Apostles, to the white sands of Clifton and rugged beauty of Llandudno and nudist beach, Sandy Bay. See the "Republic" of Hout Bay nestled below the mountains then returning to the heli-pad at the V&A Waterfront for your glass of complimentary sparkling wine. SPORT HELICOPTERS owns and operates a fleet of impeccably maintained helicopters ranging from two 3- passenger Robinson R44’s, three 4-passenger Bell Jetrangers, a 6-passenger Bell Longranger and a 9-passenger Bell Huey. All our Cape Town helicopters are maintained to the highest safety standards by our own Aircraft Maintenance Organisation. 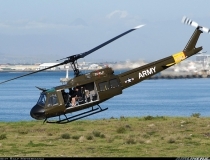 Or Click Here to view Huey Helicopter packages and tours on offer from the Waterfront Cape Town South Africa. Game viewing at Aquila Game Reserve, with breakfast and lunch.